More and more evidence is proving that your sugar habit is detrimental to your health. It can cause bloating, rot your teeth, may trigger acne, and is linked to weight gain and chronic disease. No wonder people are looking for healthier alternatives to refined white sugar. But is coconut sugar the answer? We asked both Dr. Robert Zembroski, a clinical nutritionist and functional medicine doctor, and registered dietitian Stephanie Ferrari to weigh in. Let’s first explain how the two are made. To create refined white sugar, the pulp from sugar cane stalks is separated from the juice, and then the juice is processed and heated until it crystallizes. To get that pure white color, it’s often filtered and bleached with bone char, so if you’re vegan, your sugar may not be. Coconut sugar is made by cutting the flower of the coconut palm. Once the liquid sap is collected, it’s heated until the water has evaporated, leaving that caramel-colored granulated powder. 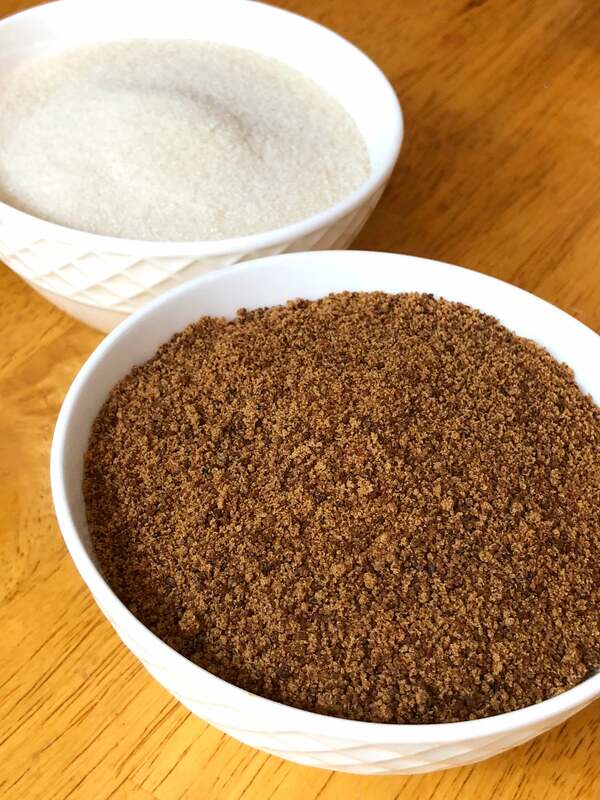 While it’s a bonus that coconut sugar is less processed, Stephanie explains that coconut sugar and white cane sugar are both sweeteners consisting of fructose, glucose, and sucrose. Robert says both contain similar amounts of fructose. “Too much fructose in the diet can disrupt metabolic functions in the liver and is linked to metabolic syndrome – a condition of high blood sugar, high blood pressure, high triglycerides in the blood, and obesity,” he explained to POPSUGAR. Are Sugar Substitutes Really Healthier Than White Sugar? As far as the glycemic index goes, a measure of how quickly foods raise your blood sugar levels (glucose), Robert says white sugar has a glycemic index of around 63 and coconut sugar has a glycemic index of 54. 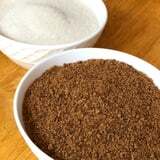 Stephanie says, “The lower glycemic index of coconut sugar delays the spike in blood sugar following consumption as compared to cane sugar.” That’s because, unlike cane sugar, coconut sugar contains inulin, a soluble fiber and a prebiotic, which can slow the rate of absorption into the blood stream. White sugar offers zero nutrition, which is why it’s referred to as “empty calories.” One benefit coconut sugar has over white sugar is that it offers small amounts of vitamin C, potassium, magnesium, calcium, zinc, iron, copper, and phytonutrients. You’d have to eat a ton, though, to get those nutrients, which pretty much defeats the purpose. Another good point Stephanie brings up is that coconut sugar doesn’t taste as sweet as regular sugar, so if you were baking with it, you would have to use more to achieve the same amount of sweetness as regular sugar. If you still want sweetness when baking, Stephanie recommends using Swerve, which is made from erythritol (fermented glucose from root vegetables and fruit) and prebiotic fiber. It’s a zero-calorie natural sugar replacement that tastes and measures exactly like sugar. Note that it has a slightly cool aftertaste but is definitely sweet, keto-friendly, easy to digest, and worth trying if you want to avoid both white and coconut sugar.